Moments are so beautiful, aren’t they? They hold such promise, so much incredible potential and are amazing for as long as they last. But the truth is also this: moments are fleeting. It’s why we need keepsakes, souvenirs, tokens, mementos to help us relive these moments many months or years down the line. As I sat here, wondering what would be my most cherished possession, or rather, one among many , my eyes fell upon this. In that instant, I knew that this would be my special object for 2016. This is the album that captures all the moments from my engagement ceremony 15 years ago. Those stolen first glances between us, the smiles at the camera that came out either awkward or cute or both, the brightly-attired women in their gorgeous sarees, the exchange of pleasantries between our families, the sighting of friends which lit up our faces and the fact that this would be a bond that would endure well past that day in April, 2001. Why is this so special? Because it’s among the only printed photographs that I possess and one of two albums that we haven’t discarded during the time we moved all our photographs into digital versions. It reminds me that some memories are beautiful way more than others and tracing our fingers over the worn edges of the photographs brings them alive almost instantly. It reinforces the belief that if something is meant to be, it will endure and weather all kinds of challenges to emerge as the one true kind of connection that draws two people together. I am grateful for this object that draws me closer to the idea of innocence and young love. I am proud to look back at these memories as ones which we can look at and which my child can marvel at when she pulls the album out of the cupboard and settles down cross-legged, knits her brows and tries to figure out whom she knows in each picture. In these precious moments spent together, I realise how much I have to be thankful for and count my blessings once again. Do you too have a cherished item that you’d like to tell me about? Do share in the comments. Cheryl Pennington, Mary Giese, Sharukh Bamboat over at Cherished Blogfest. 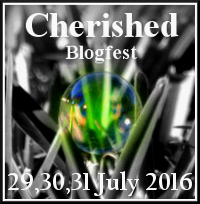 Find all participants via the Linky on the blog or via Twitter with the hash tag #CBF16 or #cherishedblogfest! Also linking this up with the monthly gratitude challenge over at Vidya Sury’s blog. Speaking of pictures, my daughter loved to look at puctures when she was younger, and she still likes to look at my old school year books to see if she can find her dad or myself in them. Although I am blind, and can’t see the pictures, I know what some of them are, because she tries to describe the pictures and ask me who the people are. My nieces and nephew love looking at pictures. The twins can point to a picture on our little linked picture frames that spell “LOVE” and tell you exactly who’s in each picture, and they’re not even two yet. What a beautiful memory to hold on to. Very sweet post. I do love looking at actual photos in albums…I mean, how often do we go back through digital ones? There’s something mesmerising about albums and it’s what I love doing when I visit my parents. Amazing! How lovely! Would have loved it if you had shared a few of those moments. I’m so curious. That’s a beautiful album. The cover is magnificent, the memories cherished. Thank you for participating in the Cherished Blogfest 2016. While I appreciate having digital backups of my photos, I could never truly give up printed photos. There’s something a bit cold and clinical about scrolling through digital images as opposed to flipping page by page through an album. And that’s a beautiful cover on your album! As an artist, I always enjoy seeing a beautiful cover on something. Even in this digital age, nothing compares to a real book or photo album. Nice post! I’m really really sad that we don’t print photos much anymore. I have a huge album of my cute and pretty photos till I was six or seven, after which digital photos came into being. Now most of them are hidden in some random folder in the computer. I miss albums, surely they are very precious things to cherish. What a sweet memory. Physical photo albums and photos are so much nicer to look at than photos online. It’s so neat that your child can leaf through a photo album with you. Due to space constraints, we’ve pretty much moved everything to digital and I miss the “old-fashioned” albums. Photo albums are like Time Machines. The moment you flip the cover and see the first picture you get transported right into that moment back in the past. It’s magical. Absolutely heart-touching. As a co-host, I thank you for your participation. Photo albums are always a treasure trove of memories. And, there’s something very charming about the print photos, no? Uma recently penned this post Do you wear a mask? Oh wow! Old picture albums are so lovely. We still have the ones of my parents’ wedding etc. Simply beautiful! Photo are such beautiful way to capture the moments. With albums like these, we can go back in time and re-kindle the memories and moments of the past any time. I am still biased towards photo albums and keep developing few pics every now and then from the large digital collection. Oho you cannot post a teaser like that – I want to jump right in and open that album. Not fair! But I do understand why this would be precious. It signifies the beginning of a life-long relationship. Very sweet and I can understand why it is so dear to me. I have a number of boxes of photos that I keep going over again and again. They are just so precious. Great idea! I do love pics. That’s why I chose actual pics to share. I htink the most important is to keep family pics, and videos, if possible. My regret is not having taken more pics of my parents before they passed away. My bigger regret is not taking vids of them to see them and hear them whenever I want to…Thanks for sharing!!! Aww I understand what you mean. Sigh, our regrets can really overwhelm us on some days. I agree albums are the perfect thing to cherish. I too find the old ones so special, have a few from my childhood and even my parents albums. Lovely idea. I suppose the need to spend less time on printed paper but somewhere along the way we’ve lost the ability to savour things in the mad rush to keep up with everything else. Digitization has helped greatly but has also taken away a lot. So many sweet memories in that album, Shy. Wonderful choice for the Cherished Blogfest! Thank you, Dee 🙂 It just happened to come to me and I am so glad I linked up this time again. Hugs for driving this each year. Lovely subject for the blogfest, Shailaja! There’s nothing like old photos to envelop you in a cloud of wonderful memories. The photo album indeed looks beautiful. Looking back at the photos from yester years brings a avalanche of emotions. And when it happens to be wedding photographs, all the more so. Oh so sweet. I love albums. They are such treasures. Our wedding album contains the engagement ceremony pictures too cos both the days were one after the other. I would love to keep them somewhere closer so that I can see those pictures whenever I want. Last year, I wrote about a calendar that has our wedding pictures. The feeling is a blessing for sure. Lovely one, Shailaja. Aww a calendar is such a lovely idea, Parul! 🙂 Thanks for reading. I am not usually one for keeping too many mementos, but some are special indeed. Small souvenirs from places I’ve traveled to always bring a smile to my face due to the memories they invoke of happy times. Albums/photos – you have just 2!! How is this possible? I have numerous albums and boxes of old pics that I keep thinking of digitizing and discarding, but somehow I know it won’t be the same and back to the shelf they go :). Sigh, don’t ask. Long story and we regret throwing them away now. Blame it on the frequent moving around from city to city and house to house and lugging things around seemed a pain.